Stir in a spoon of instant cappuccino powder and a spoon of demerara sugar to a cup of hot milk to make fresh cappuccino coffee. 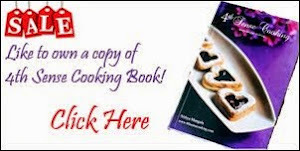 Allow it to come to room temperature and put it in the refrigerator for at least half an hour. 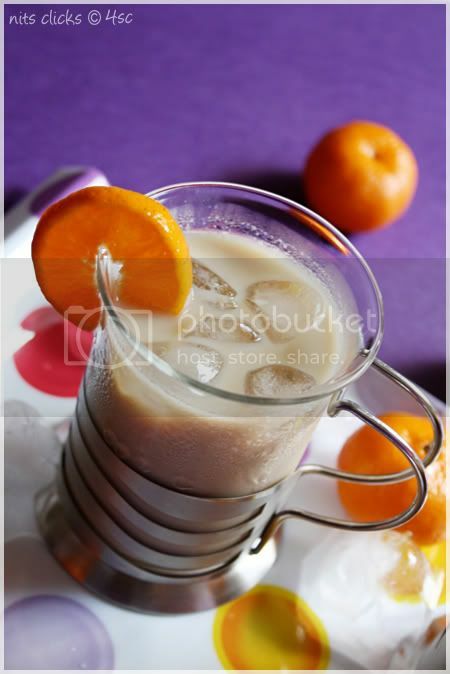 Remove from refrigerator and add two tsps of fresh orange juice to the coffee and stir it immediately. Beat in a tsp of whipped cream and a pinch of orange zest as well. 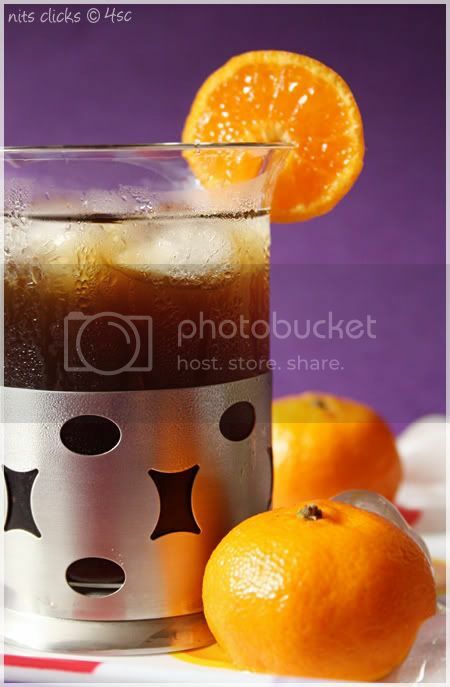 Serve topped with few cubes of ice and decorate it using a slice of orange. 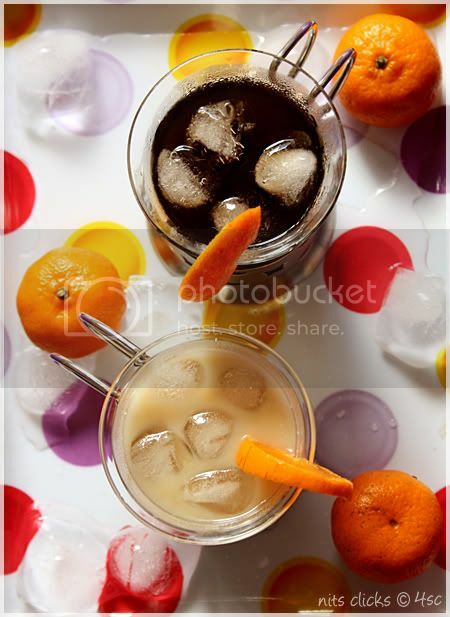 You can make orange flavored black coffee as well by stirring in two tsps of orange juice in coffee decoction and top it with some ice cubes. You can use orange juice syrup instead of fresh juice. You can also use two drops of orange essence to make flavored coffee. Mixing orange juice with hot milk will curdle the milk. So make sure you add the orange juice only when the coffee is cold. orange and coffee is a classic combination. I love them in cakes as well. looks so so soothing. love this recipe. between have mailed you regarding Arusuvai. Thanks for your interest Nithya. lovely combo ! fabulous clicks ! hmmmmmmmmmmmmm!very very refreshing.I am very thirsty can I grab the glass and have? But I love coffee any time. Since here its chinese new year the tiny oranges tastes great. I will try soon. Looks nice. 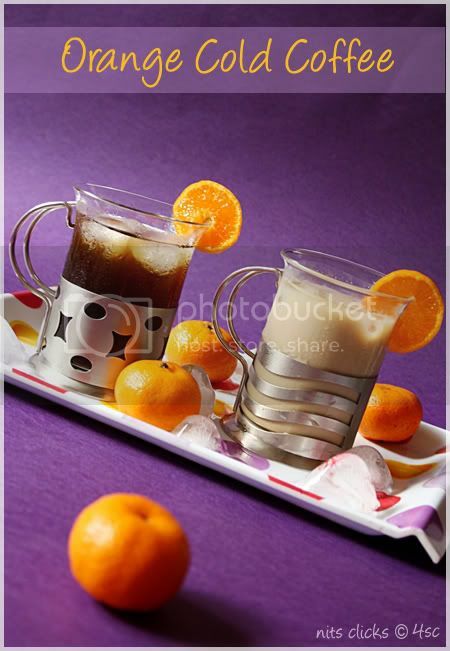 Never had cold coffee.must try..
Orange flavoured coffee thats really tempting..beautiful clicks..
thats looks very fantastic,never tried cold coffee till date. I love my coffee and tea, but love your cold drink too. 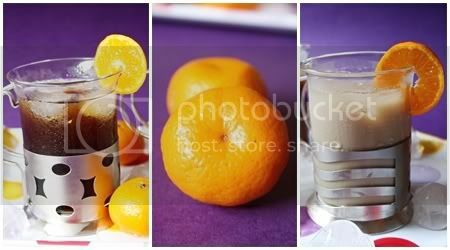 Refreshing and delicious drink..great clicks dear. Me too I don't drink coffee or tea unless it is cold :) Love all flavors in Coffee and tea which is widely available in Singapore and here. Looks refreshing Nithi. Delicious coffee...love the citrus flavor!! 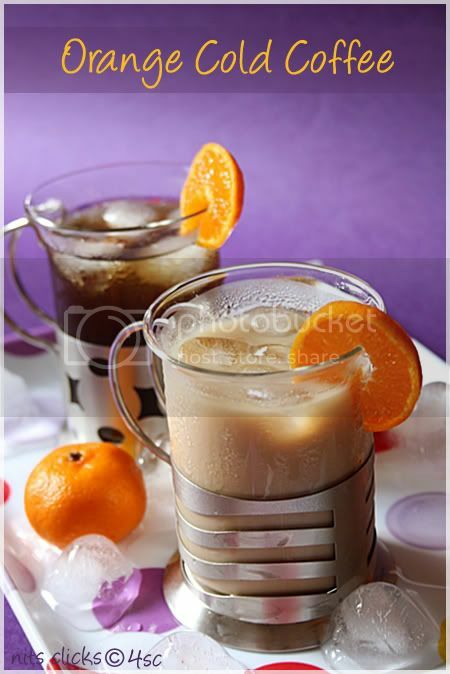 Love cold coffee,I make them quite often,looks delicious. Love cold coffee and this looks very refreshing. OMG, that is amazing and mouth watering. I hate coffee but this one is thinkable!!! Orangy caffeine is quiet a different combination. Should try out... Ur pics r great! i love the combination of purple and orange. Gud job buddy!!! too good for the hot climate, let me see if I could prepare it.. or I will for sure have one from the nearest ice cream parlor. Good one for summer. Well Served. Wow, Can I have a sip pls..looks so inviting coffee. Beautiful presentation and clicks Nithya. Rau câu chắc hẳn là món ăn mà mọi người yêu thích,vị mát lạnh, dẻo,dai ăn hoài không thấy ngấy chính là điều đặc biệt mà rau câu mang lại cho người dung. Cho nên hiên nay có nhiều người tìm hiểu các cách làm rau câu dẻo trên Internet . việc làm râu câu vô cùng đơn giản không mất quá nhiều thời gian bạn sẽ có ngay món rau câu thơm ngon mát lạnh như ý.